A while ago i held a talk at the ccc in cologne about my favorite game console the Super Nintendo. This talk covers the Super Nintendo technology in detail. 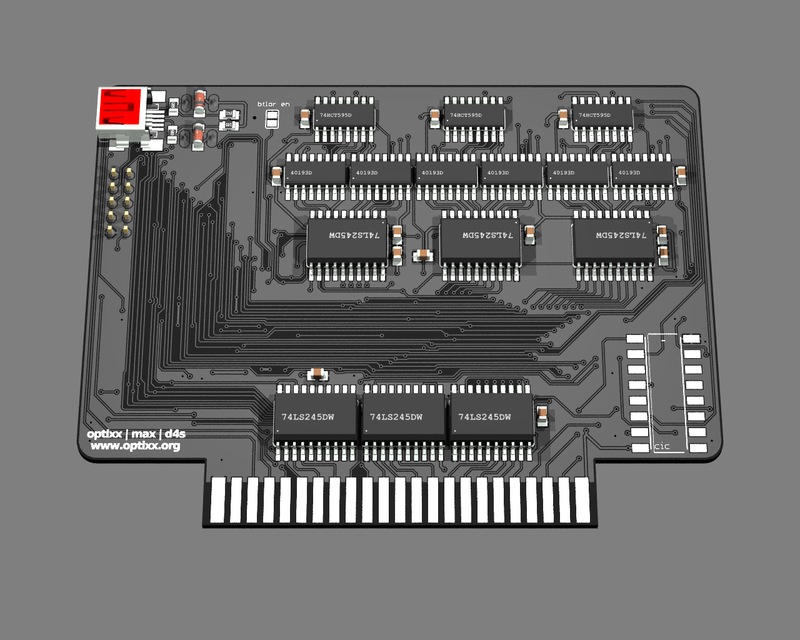 Starting with the CPU and PPU, covering the cartridge memory maps and showing most of the custom chips which where used on cartridges. I also show development hardware, copier stations and the current available flashcarts. The topic emulation is also covered . 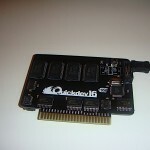 The second part of the talk is about the quickdev16 project, which i did with my friend max in 2009. 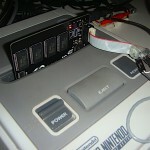 We built a flashcart for the SNES which is useful for developing homebrew software. The talk sums up all the details i learned during the research i made to built this kind of cartridge. I uploaded the slides, maybe someone find this useful to dive into the SNES world. 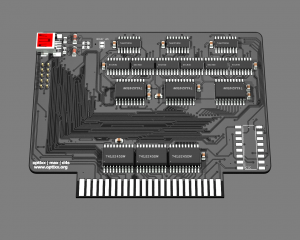 Some time ago i saw this Memory Visualizer for Frodo and Vice C64 Emulator . I got inspired to do something simular for the SNES. I took this idea an hacked it right into BSNES. 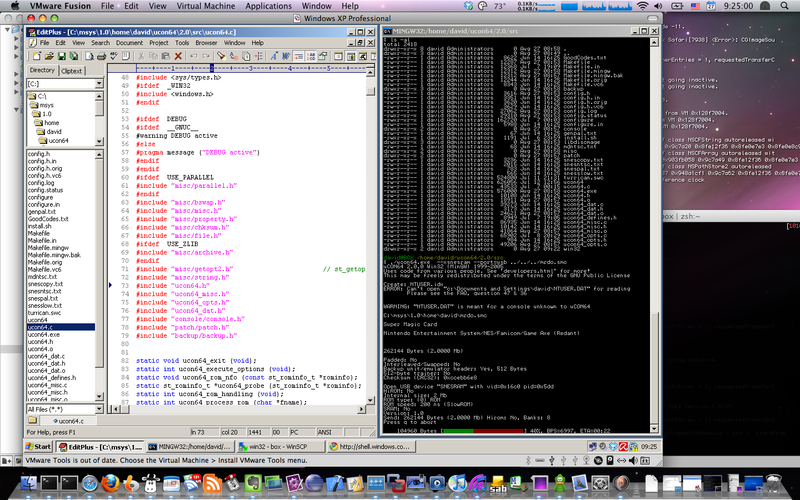 Right now i have 2 fields representing the WRAM and the VRAM of the SNES. So it displays different colors for read and write access to the memory areas. Due fading this generates some color blending effects. This is just a quick hack which was lying on my hd for some months. So its based BSNES version 0.59 , which is know a little outdated. It would need some more polishing and a better solution to display the 2 Ram areas. The GL cubes look a little lame. Also the emulator performance is not quite there so that the roms a little bit slow. Eyecandy: new logo design with sine wave effect and bassdrum synced background effects..
Due to these features the loader blew up to more than 55kb, too much for our limited space in the AVR progmem (64kb – 4kb bootloader). 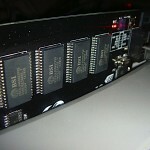 Our main firmware is between 8kb and 24kb, depends on the debug-features that you compile in. So the recent task is to either reduce the loader size by skipping eyecandy, finding a better compression routine to compress it in the progmem or build a minimal firmware and put parts of the loader into the surplus 4kb eeprom on the AVR. Probably we will have to combine the different approaches. One reason why the firmware is that big these days is the new “minimal debug terminal”, a serial command line where you can maintain the Quickdev system status. You can dump memory regions from sram, switch between the busses, write to the shared memory section, show the status of the hardware ports and use several other usefull commands. Check the project page for more details on the commands. 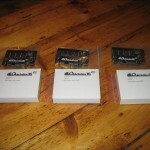 Last week we shipped the first batch of Quickdevs. The Software is feature ready, but we wanted to do some eye candy on the SNES software side, which didn’t work out yet. So software updates are coming within the next weeks. Feel free to order at david @ optixx.org. Quickdev16 Project Page is ready. 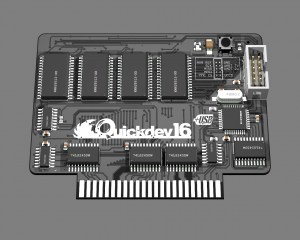 Finally our project page for the Quickdev16 becomes available. You will find information how to download or build all needed software from scratch. We gonna build the first batch of 10 cartridges this week. So stay tuned. 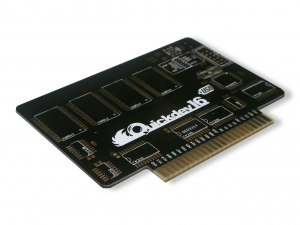 Not “out of the box” but with only slightly changes on the software part, the new quickdev16 PCBs are working. Their shape fit the SNES cartslot, the changes in hardware design and parts worked out great and we have a kind of stable firmware and upload tool. When you turn on the SNES, the microcontroller extracts a small loader-rom into the cartridge RAM that is mapped into the SNES addressspace. This one copies itself to SNES’s WRAM and jumps into it. So the cartridge RAM is unaccessed and we can safely switch back to the AVR mode to push a real payload rom onto the cartridge. We are also working on a shared memory function so that we can use the cartridge RAM to exchange infomation between the AVR and the SNES. This will be used to display a proper Progressbar while uploading a rom. As usal you can use our patched version of ucon64 – even under windows – to upload a game to the quickdev16. When the upload is done, the SNES reset line is pulled by quickdev16 and the game starts. When you press the reset button, you only reset the game, not the quickdev16 – it acts like a normal cart. When you press the reset button during the upload process or while watching the loaderscreen, you reset the quickdev and can abort uploads or just restart the quickdev16 – thats a really usefull feature. To initiate the upload of a new game, just start the upload process with ucon, the quickdev switches to the loader mode by itself and receives the new ROM. So the steps are now to improve the loader code, finish the progress bar stuff, figure out how to solder the PCBs faster than now and add some minor features. Stay tuned for updates, it’s not too long to the release. Created a binary for windows using minGW and libusb. 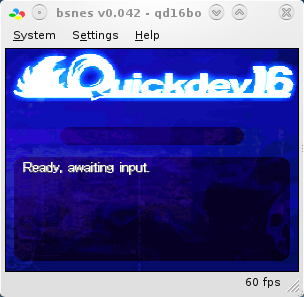 So i can confirm that quickdev16 will work under Windows. 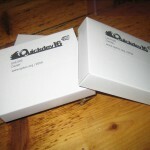 I start taking inoffical pre-orders for the Quickdev16 now. Just send me an email to david at optixx.org with your name and email address. In order of arrival i will put you on the pre-order list. Right now we plan to sell around 35 cartridges. Why inoffical pre-orders list? A fews points are unclear right now. I don’t know the final price since this will depend on the assembling costs which are not setteld yet. I can’t say if the the new PCB are working 100% since we didn’t test it yet. Also we didn’t figured out if we gonna ship the cartidge with a CIC chip or not. The client software is tested and developed under Linux and OS X. Can’t say much about windows. But if you can compile ucon64 with libusb support in windows you should be fine. I will give this a shot soon. These points will clear up within the next 2-3 weeks. But expect an sale price around 100 USD or 80 Euros. I gonna use paypal for international shipping and direct debit in Germany and even Europe. Will provide an an IBAN and paypal account later. I don’t take any money before everything has clear up. So the pre-order is not binding as long as you are not happy with the final outcome of the project. I just started this pre-order list, since a few people start asking for it and they don’t want to miss the opportunity to get one. Just a quick preview of up coming features. Finally we found a better name for the snesram and renamed it to ‘QuickDev16 USB’. Final PCB layouts are ready and will be send to china soon. So in about 2 weeks we will have our first PCBs.